One of Manchester's most famous daughters is set to take up permanent residence in the city once more. 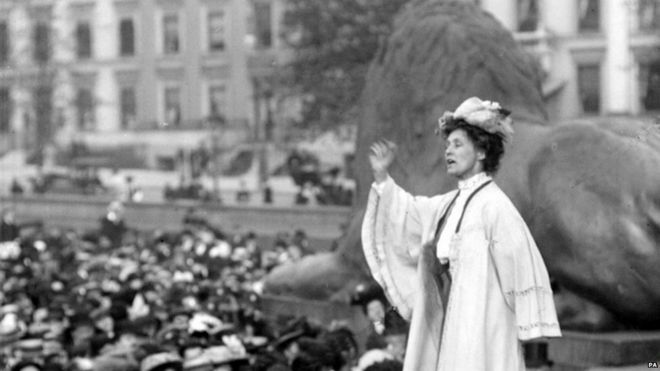 Emmeline Pankhurst is one of the most important figures in recent British history and she will soon be immortalised with a statue in her home city. 'Rise up Women,' by artist Hazel Reeves, was unanimously chosen by a judging panel from a shortlist of six after a competition to find the statue's design was held which attracted entries from some of the country's leading sculptors. Pankhurst's great-granddaughter Helen was on the judging committee and told the Manchester Evening News, "Hazel's creation has rightly risen to the top. It is memorable and evocative, a simple and yet very powerful evocation of one of the most iconic women in history." The new statue is expected to be completed in time to be unveiled on International Women's Day in March 2019, and will be sited in St Peters Square. Born on Moss Side in 1858, Pankhurst (nee Goulden) became a leader and tireless campaigner for women's suffrage. She was responsible for radicalising politics and her fearless campaigning brought about some of the most seismic changes British politics had ever seen. Emmeline married at age 21 but her husband Richard was already a supporter of women's rights. Richard penned the Women's Property Acts which helped married women own properties in their own right. As well as her husband, Pankhurst was also influenced by her politically active family and became passionate about women's suffrage when she was a teenager. These influences motivated her to found the Women's Franchise League which campaigned to get married women the vote. The League didn't enjoy much success with their lobbying and, in 1903, Pankhurst, who was now widowed, founded a new organisation which employed much more direct action. The Women's Social and Political Union (WSPU) catapulted Pankhurst and her band of suffragettes into the public eye - and the headlines. The group's militant tactics were a huge shock to Edwardian society which was quite unprepared for the extreme tactics employed by the suffragettes. Pankhurst and her supporters vandalised property, attacked policemen and chained themselves to railings. Women were imprisoned and, Pankhurst among them, regularly went on hunger strike. The authorities responded with a horrific force feeding regime which in turn led to the WSPU adopting even more radical tactics including arson. Emily Davison's death at the Epsom Derby was an example of the increasingly desperate measures the suffragettes resorted to in their campaign. Pankhurst's three daughters, Christabel, Adela, and Sylvia were all members of the WSPU. Christabel became the leader of the organisation but Adela and Sylvia, appalled at the increasing militancy and clashes with authority, left the group much to Emmeline's anger. Adela eventually emigrated to Australia and never repaired the rift with her mother. The outbreak of the First World War saw the WSPU call off their campaign to support the war effort. Their efforts were recognised in 1918 when the Representation of the People Act gave the vote to all women over the age of 30. In 1928 the act was amended and the right to vote was extended to all women over 21. Unfortunately, Pankhurst didn't live to see this victory for women's suffrage and passed away just a few weeks before the act became law. The incredible life and amazing achievements of Emmeline Pankhurst saw her named as one of the 100 Most Important People of the Century by Time. Now, the new statue in Manchester's St Peters Square will see a long overdue monument to her in her home city.